Congrats, D! That is an awesome accomplishment. I can't believe you even shopped small for the guys!? That's what I always struggle with when it comes to shopping small. Speaking of independent shopping and Etsy, did you know about Etsy Treasury? I first learned about it from this post from SF Girl by Bay. You know how on Etsy's homepage they always have those really beautiful collections of goods that all seem to go together? Well you can create your own. Just for fun or for shopping, etc. Like everything else these days, the Treasury can be made viewable to the Etsy public and therefore commented on and "liked". 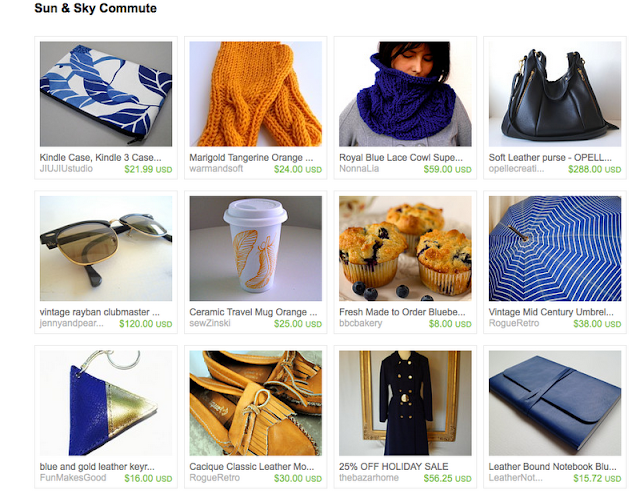 If Etsy deems your treasury beautiful enough, you can end up on the homepage! Pretty fun, huh? Could be good for next year's Christmas shopping or if you want to view a bunch of items side by side to compare. OR to pretend you work at Etsy. Which is what I did. PS: Readers: Did you know about our Diggin' page? Enter work time waster #14,597. What did our parents do at work all day without the internet? Actual, real work? Maybe that's why they were home for dinner at 6 every night. I agree. I also convince myself it all ends up the same because we can work so much faster with the internet. Right. Right?